World Food Day takes place every year in honour of the founding of the UN’s Food and Agriculture Organisation (FAO). It is a day of action to raise awareness around global hunger and how we all have a part to play in achieving #ZeroHunger. This year, EIT Food would like to celebrate individuals who are making a small or big difference when it comes to the future of our food. “Our Actions are our Future” is the FAO’s World Food Day (#WFD18) slogan this year and they have pulled together a list of family farmers, chefs, activists, private businesses, government employees and officials who are making a difference through their actions. At EIT Food we meet, support and learn from some amazing individuals working to revolutionise the Food Supply Chain across Europe. 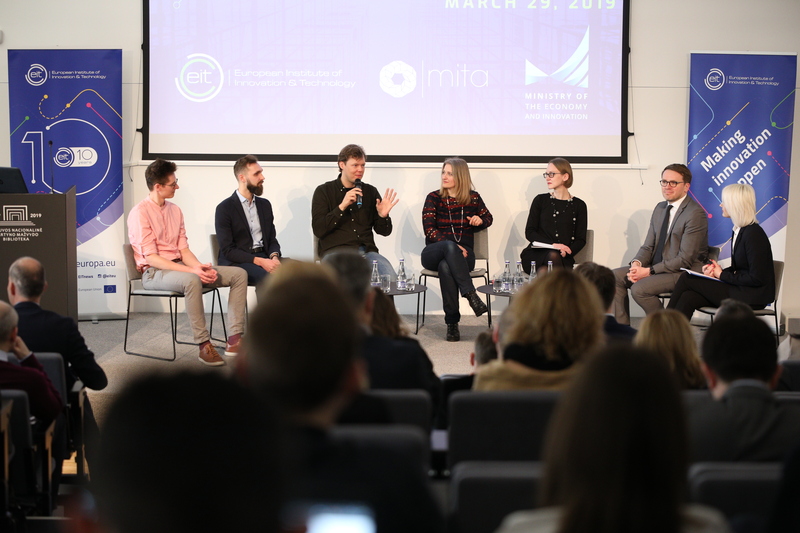 A few of these innovative talents have been nominated to compete in the EIT Awards, which highlights those who are driving European innovation through ground-breaking products, projects and services that tackle global challenges. They are food heroes in our eyes. An important focus of the FAO’s campaign for everyone to play their part in achieving #ZeroHunger is to waste less food. “Love your left overs”, “buy only what you need”, “store food wisely”, “put your food waste to use” are just a few of the list of simple actions that the FAO encourages you to take to make #ZeroHunger a way of life and to re-connect to food and what it stands for. We have decided to make Food Waste the topic of the day at EIT Food and are organising our “Food Waste Challenge” event in London on 16 October, bringing together innovative startups, entrepreneurs, businesses and universities to landscape current food waste challenges and deliver actionable solutions across the supply chain. In the run up to World Food Day, share a photo of your #FoodWasteHero and explain what they mean to you. This could be someone famous who has influenced you in your lifestyle and eating habits, or a family member, friend or local acquaintance who is taking action to help reduce food waste on a small or large-scale. Share a photo of your food waste hero on Facebook, Instagram or Twitter and explain the reason for your choice in the caption. Don’t forget to include the hashtags #FoodWasteHero and #WFD18 and to mention @EIT_Food (Twitter and Instagram) or @eitfood.eu (Facebook) so we can find you! On Facebook, remember to set your post to public before clicking send. The winner will be announced live on Twitter after 15:00 on 16 October during our Food Waste event in London so stay tuned! The selected panel of innovative food waste hero judges will select the winner based on the most touching, funny or impressive Food Waste story. As well as the simple pleasure of raising awareness around such an important topic, the winner will receive their very own Zero Waste Toolkit with a selection of products and utensils, including an amazing sustainable cook book and other #ZeroWaste goodies to help you start your own food waste challenge at home. • Participants must have an EU address (in order to be able to receive the prize). • The “best entry” will be the most touching, funny or impressive Food Waste story as decided by our judging team of food waste heroes. 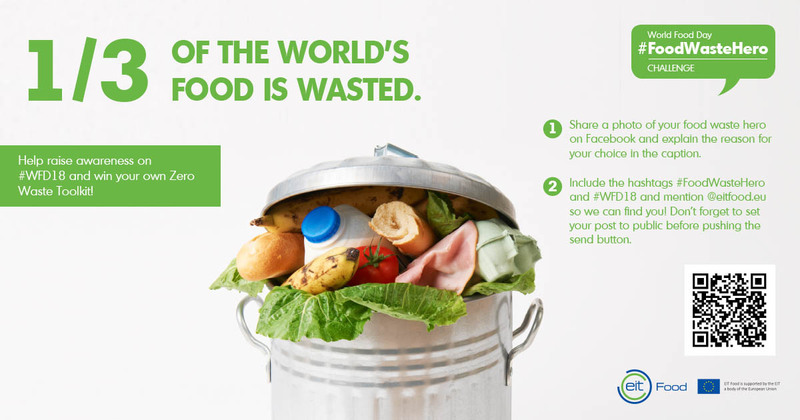 • The post must include the hashtags #FoodWasteHero and #WFD18, and mention EIT Food to enter the competition. • It runs on Facebook, Instagram and Twitter only. • The competition is in no way sponsored, endorsed, administered by or associated with Facebook, Twitter or Instagram.